“Dedicated to the pioneer Bushwalkers of New South Wales who saved this place, and opened out eyes to the wild beauty of the world”. The above dedication opens 1996’s Wild Australia: The Edge, an IMAX documentary that focuses on the continent’s Blue Mountain region, an area that, despite residing directly next door to the bustling metropolis of Sydney, is still as it was millions of years ago (“When the Grand Canyon was a shallow creek”, the film informs us, “these valleys looked much as they do today”). Narrated by Hugo Weaving, Wild Australia: The Edge takes us deep inside this beautiful region (a good portion of which was declared a National Park by the Australian government), revealing its wonders as well as its dangers, and shedding light on a discovery that has shocked researchers and conservationists the world over. Much like Australia: Land Beyond Time, Wild Australia: The Edge takes full advantage of the IMAX format to present some breathtaking visuals (in a sequence that must have looked amazing on the big screen, the camera seemingly floats along a river, then glides over the edge of a waterfall, peering down as it does so). What makes it all the more impressive is that the Blue Mountains (which, incidentally, were also used as a key setting in the 1987 adventure / drama Initiation) are a natural time capsule, a look at a corner of the world as it existed before man was so much as a gleam in Mother Earth’s eye. In what is arguably the movie’s most dramatic moment, we follow a pair of explorers into an ancient cave system, where, with a reverence one would normally reserve for a church gathering, we're treated to formations that haven’t changed since the days of the dinosaurs. It is truly a sight to behold. But even at this juncture of the movie, the best is yet to come. Late in Wild Australia: The Edge, the filmmakers are taken via helicopter (with blindfolds over their eyes) to an area that contains the Blue Mountains’ most prized possessions: Wollemi Pine Trees. Thought to have been extinct for the past 65 million years, these trees have survived is this region for a very long time, and conservationists, fearing what might happen if their location is revealed, work tirelessly to prevent the whereabouts of these ancient conifers from becoming known. At the time this documentary was made, these Wollemi Pines were a fairly new discovery; an adventurer named David Noble found them, quite accidentally, in 1994 (“It was about as likely as finding a dinosaur wandering through the forest”, says Weaving), and the inclusion of these prehistoric trees further drives home the fact that the Blue Mountains are one of the earth’s most remarkable regions (the cameras were even there to capture something that, in all likelihood, has never been seen before: a young pine cone, hanging from a branch in one of the trees, releases its spores into the air). 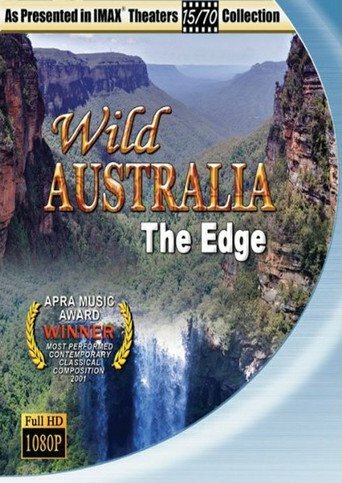 As you might expect, Wild Australia: The Edge adopts a pro-conservation stance that’s prevalent throughout the entire film; early on, we’re told that, at one point, there was a species of trees native to these mountains that stood over 435 feet (133 meters) tall. We know how big they were because they were measured by the men who cut them down. Though not subtle, such a position, especially with regards to this unique area, is certainly warranted, and I, along with everyone else, hope the Blue Mountains remain as they are for many, many years to come.